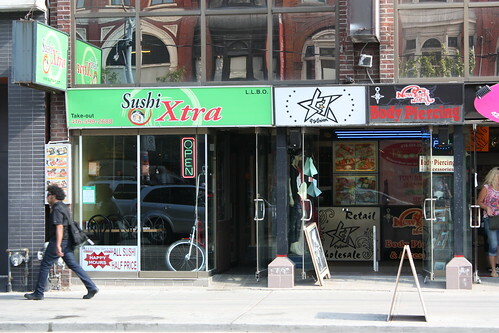 Sushi Xtra is located on Queen Street West, just east of Spadina. The Sushi Toronto review team decided to check it out after purchasing a half price group deal from RedFlagDeals.com Deal of the Day. Please read our conversational review, below. 1.0 / 10We simply got ripped off. Avoid at all costs. 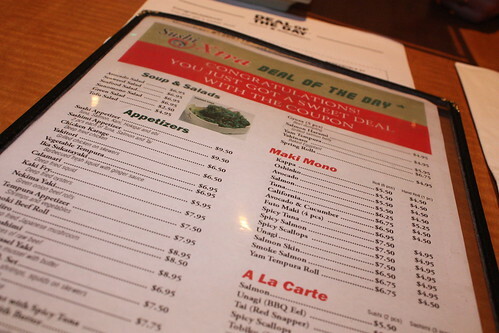 0.0 / 10Xtra refers to xtra shady business practices — If you bring a deal coupon you will get the menu with jacked up prices. Avoid! So it’s about time we hit this area as there’s tons of different restaurants here, including lots of sushi choices. 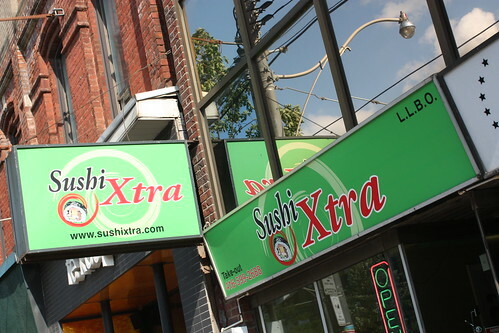 Walking on Queen, from University to Spadina, I must have passed 3 different sushi restaurants before finally hitting Sushi Xtra. Hmmm… Ok let’s put that aside for a second and talk about the food first. 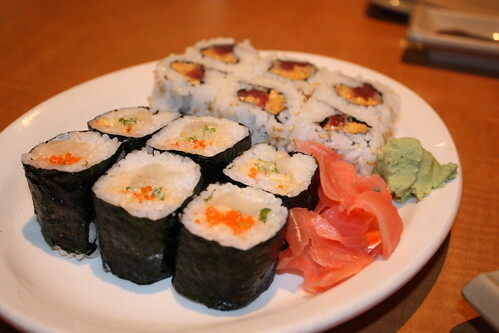 We ordered the Spicy Tuna, Spicy Scallop, Sushi Xtra, and Fire Dragon rolls – and a large Sapporo! Food came out pretty fast with the first being the Spicy Tuna and Spicy Scallop rolls on one plate. I did notice that there were using generic plates rather than Japanese style plates or those wood/bamboo plates. They tasted alright and were a bit on the spicier side than most other places. 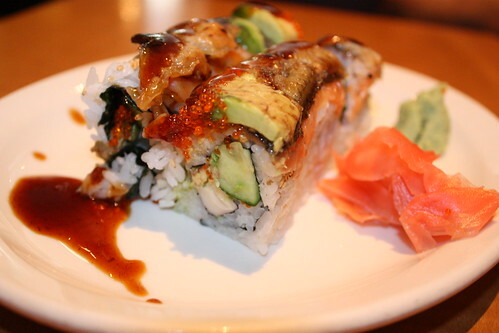 Yes… No real complaints here regarding the Spicy Tuna roll. It wasn’t amazing, but decent. The Spicy Scallop roll I really was not impressed with. I wouldn’t order that one again. Sakura on Adelaide still has the Best Spicy Scallop roll in my books. Hmm, you’ve mentioned those Sakura spicy scallop rolls before, I am really going to have to see for myself sometime. Next comes out their marquee Sushi Xtra Roll. The bbq eel topping looked a little rough around the edges but again tasted pretty good but had a bit too much sauce. 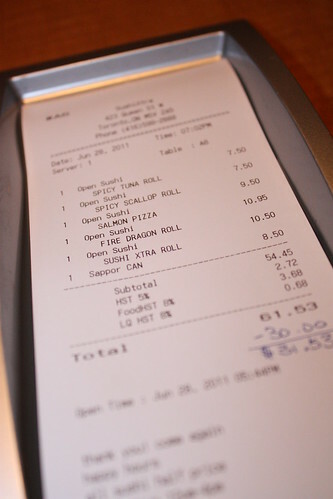 I liked the Sushi Xtra Roll – no real complaints from me. 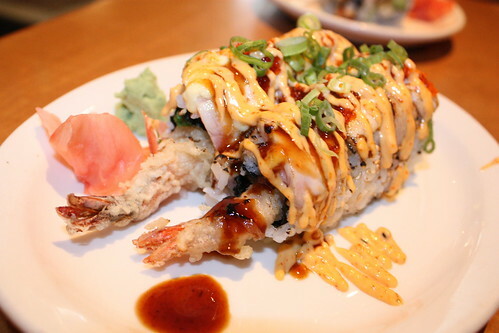 The final roll was the Fire Dragon Roll that was actually recommended multiple times by Foursquare users. It’s shrimp tempura and avocado topped with white fish and baked. It definitely was unique—had a smokey taste to it – for lack of a better description. I wasn’t a huge fan but it wasn’t horrible or anything. The smokiness doesn’t seem proper for sushi, in my books. I’ll agree with your there. There was a unique smokey taste to it but I am kind of on the fence with this one. I found it a bit weird to eat, but nothing really that bad about it. Again, there was a bit too much sauce for my liking. Don’t like when the sauce over powers the natural flavours of the rolls. Last dish to come out was the sushi pizza. Usually that comes out first but whatever. Things are a bit different here! Again it tasted decent. The portion size seems small to me compared to other places though. 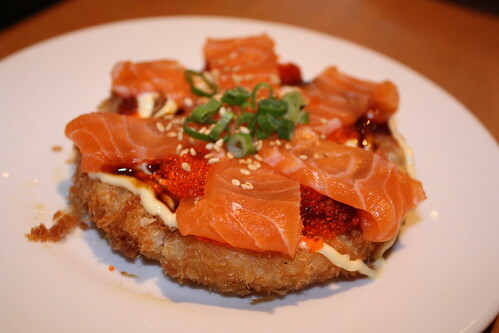 Ah!… I forgot about the sushi pizza above… Indeed that was our final dish. No real complaints here — it was pretty standard and not much else. That covers the food — now back to the ‘Deal Menu’ we were handed once they realized we were using a group-buy coupon. First thought was the ‘Deal Menu’ had prices that were cranked up — essentially eliminating the ‘deal’. The above is around an $11 difference. Our coupon saved us $15 (so, um, I guess is really saved us $4). It seems that Sushi Xtra is extra shady in their marketing practices! Yes unfortunately, our early suspicions were correct. Makes sense since what other reason could there be for different menus? There’s nothing like leaving a place feeling like we just got scammed. I would have given the food probably 7 / 10 but based on our investigation: 1/10 for me. I’ll never go back to a place with shady business practices. Goodbye Sushi Xtra. I’ll trump your 1/10 and give it a 0/10… Don’t give Sushi Xtra your money. There’s plenty of other sushi places in Toronto.